When your feelings of loss and sorrow compel you to make a grand gesture of sympathy, this dramatic, standing arrangement is a lovely way to convey your sincerest condolences. 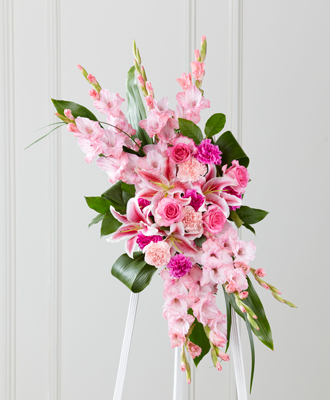 This extraordinary composition of pink blooms and lush greens handcrafted by an artisan florist includes roses, carnations, gladiolus and Stargazer lilies set among lush, contrasting greenery. Made to be displayed on an easel, it makes an appropriate choice for a wake, funeral or graveside service, sure to be much appreciated and long remembered. Product is not appropriate to send to a residence.